Living in our apartments on Wilmington riverfront puts you in one of the most unique situations in the Northeast. Not only do you have convenient access to a slew of East Coast cities like Philadelphia, New York, Baltimore, and Washington D.C., you get to enjoy the beauty of waterfront living in a bustling city bursting with history, arts, and culture just minutes from your front door. A life at The Residences at Harlan Flats means you’re steps from some of Wilmington’s best attractions situated along the beautiful Christina River. From shopping to dining to entertainment and more, there’s always something to enjoy along the river. 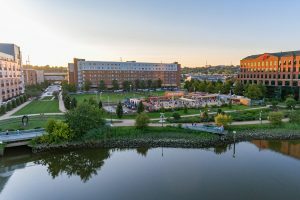 The riverfront is home to a 1.3-mile trail that takes you along the Christina River and past businesses, open space and everything the Wilmington waterfront has to offer. From the Wilmington Blue Rocks’ bats to the serenity of the moving water, there’s something for everyone down by the river. Living at our apartments on Wilmington riverfront means you’re at the heart of it all. Whether you’re interested in catching a delicious weeknight dinner at one of the many eateries or you just want to go for a stroll after a particularly stressful day at the office, it’s all within steps of your front door. The Residences at Harlan Flats wants to make your life along the river as simple as possible. We offer a variety of spacious floor plans with upgraded features and a slew of amenities. Our Wilmington apartment community features an on-site pool for soaking up the summer sun, a courtyard for enjoying warm nights after an evening along the river, and a lounge for relaxing with your neighbors and friends. Our stunning apartment homes also feature balconies and floor-to-ceiling windows that allow you to take in beautiful views even when you’re not down on the riverfront. With easy access to everything you need, you’ll love living your best life at our apartments on Wilmington riverfront. To learn more about the Residences at Harlan Flats or to schedule a tour of our stunning community, contact us today!